At 600mm deep and 900mm wide, the powerful ESLR9C/SPH has six hotplates and a large oven for increased productivity. The 190mm-diameter hotplates have automatic power reduction if the pan boils dry or is removed, which prolongs the life of the hotplates. The twin fan-assisted oven has thermostatic temperature control of 50-250°C, giving uniform heat and consistent cooking. 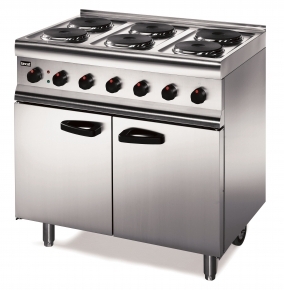 The Silverlink 600 single-phase electric oven range has a fully-pressed and sealed hob top, and removable oven base, to make the unit easy to clean and maintain. Castors at the rear make it easy to pull out for cleaning. “Our Silverlink 600 oven ranges are the mainstay of many commercial kitchens due to their capacity, reliability, efficiency and safety. This is why we wanted to manufacture a version that can be used in kitchens with single-phase power.